“And Greenpeace says we’re all gonna die,” you’d add, helpfully. The person dumb enough to ask the question would hang his or her head in shame and slink away, muttering incoherently about conspiracy theories and invoicing Big Oil. And you’d feel happy and ever so slightly smug, knowing that everything is in good hands. And it is, isn’t it? Of course it is. NIWA processes and holds the raw temperature data for all of New Zealand, collected from a myriad of weather stations across the country and on some islands too. Like most countries around the world, it sends it all off every now and then to be amalgamated into an enormous Dataset in the Sky, called the Global Historical Climatology Network, or (thankfully) GHCN for short. The good people who manage this for us are the US’s National Climatic Data Center (NCDC), part of NOAA (National Oceanic and Atmospheric Administration). They claim they hold “The World’s Largest Archive of Climate Data”. I suppose somebody has to. The whole lot gets churned over monthly and when the dust settles it spits out another alarming graph showing sky-rocketing temperatures. The graph is then used to tax us. It’s a simple system and we seem to like it, because we hold rallies and sit-ins to protest that we’re not being taxed enough. “More taxes!” we demand, waving our new graphs. However, what few people know is that before the data is churned there are some little “inhomogeneity” adjustments that get applied to the raw temperatures, just to sort out minor issues, you understand. They take care of things such as station moves, equipment changes, urbanization, and so forth. Nothing serious, they won’t affect the overall trends at all. Hardly worth doing, just a tweak here and there. You’ve probably guessed by now where this is going. Well, it turns out that the inhomogeneity corrections are not as innocuous as they sound, judging by their effect. Now I know the scientists will have all sorts of arguments as to why they should do them, and point to peer-reviewed papers that discuss in gory detail topics such as “t-tests” and “subannual differences over symmetric intervals”, and so on. 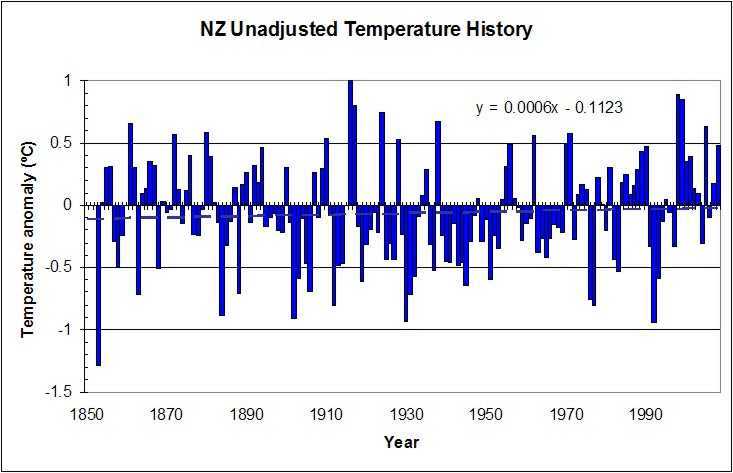 But what really matters, when all is said and done, is: what effect do the “corrections” and “adjustments” actually have on the New Zealand temperature series? On the trends? 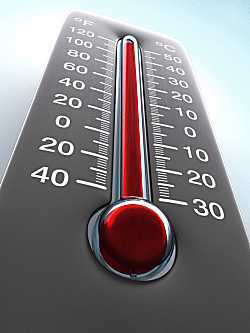 How much quicker or slower will we appear to have warmed? And how come New Zealand has apparently been warming faster than the rest of the world over the past century? Most global estimates are in the 0.6ºC per century area. We’re apparently almost 1ºC. Let’s take a look. The NIWA graph I mentioned at the start is made up of data from seven long-term stations scattered around New Zealand. They are Auckland, Wellington, Masterton, Nelson, Hokitika, Christchurch and Dunedin. 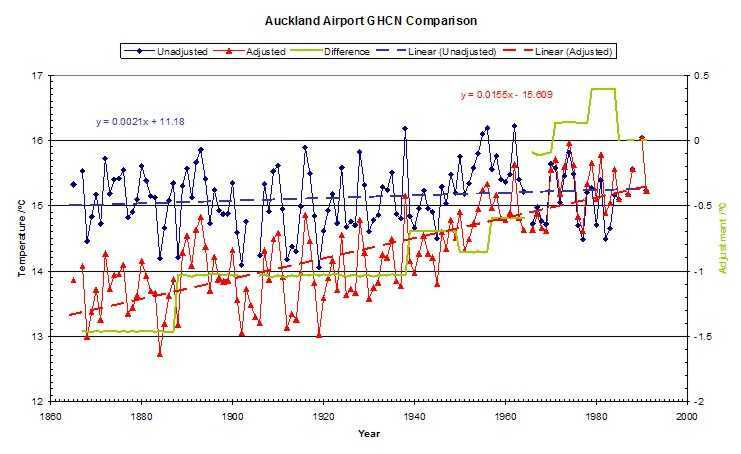 Auckland and Dunedin have temperature histories that go back to 1853 or thereabouts, the rest kick in around 1864. Fortunately, we have access to the GHCN datasets online, so we can compare individual stations before and after the “corrections”. We also have access to the NIWA raw station data, so we can look up any station’s history and see if and when any equipment (or even the whole station itself) was moved. So we can see if any “adjustments” make sense. After all, if an adjustment is so large that it affects the temperature trend of the station significantly over a hundred year history, the reason for the adjustment should be obvious in the station history, right? Something like a major meltdown in the station instruments comes to mind here. So we pull the data and extract little New Zealand from the huge amount of data in there. We’re country 507, did you know that? Well, we are. Then from the NZ data we pull out our seven long-term stations (well, five actually — it turns out we don’t send Masterton to NCDC at all, and for Nelson NCDC use only a short period from 1951 to 1970) and we plot the results. At first we don’t believe what we see, so we check that we downloaded the right files. We check and re-check the data, because what we’re seeing is astonishing: four of the five long-term stations (Dunedin is the exception) show severe and unexpected adjustments, and they end up much warmer in recent years relative to the past. How did this happen? Quite simply — the earliest years are almost all reduced drastically. So what does this do to the trend? Well, if you anchor a graphed line on its right-most point, and then swivel the left-hand side down, what does that do to the trend? The answer is: it increases warming, depending on how much you swivel it. Auckland is pushed down -1.5ºC, while Wellington is reduced -0.5ºC. Christchurch drops by up to -1.3ºC. 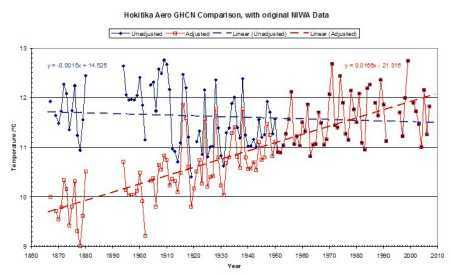 Hokitika is a shocker – it loses a full -2ºC! How does all this graph-swivelling affect things? Quite a lot, as it turns out. Auckland has its trend increased 7-fold, from a mild +0.2ºC to +1.5ºC per century. 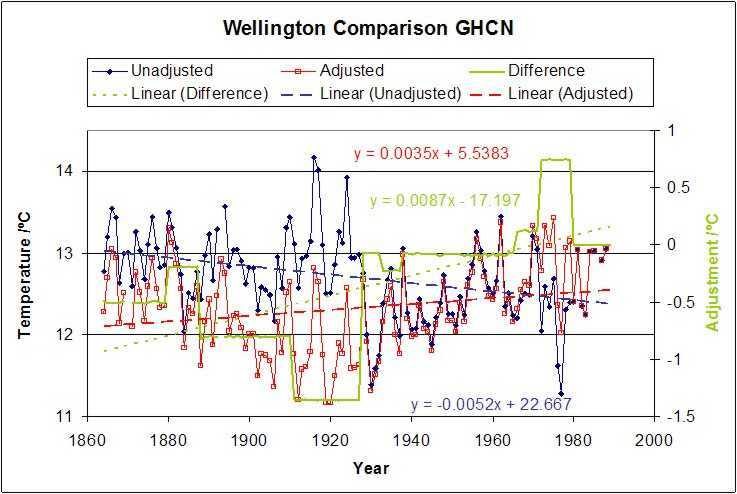 Wellington goes from cooling (that’s right – cooling!) at -0.52ºC per century to warming at +0.35ºC per century. 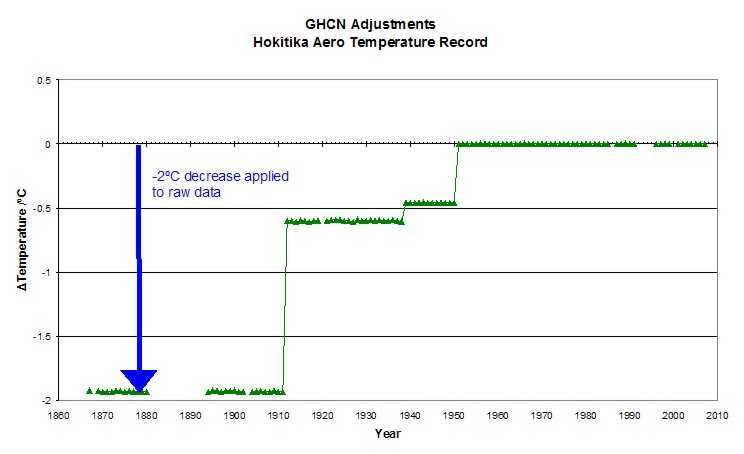 And Hokitika takes the biggest hit: from cooling at -0.15ºC to a whopping +1.7ºC of warming! 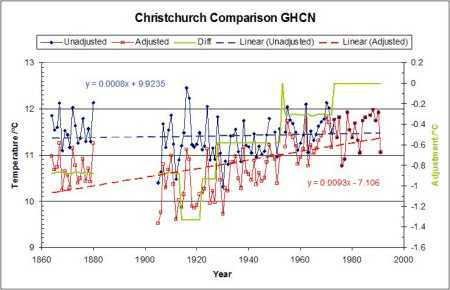 Christchurch jumps from a negligible 0.08ºC to 0.93ºC per century. The only one to show the opposite trend is Dunedin, which drops from 0.7 to 0.4ºC. Looking at the Dunedin data, I can understand why it was adjusted – the data jumps all over in the early years. But to be honest, it’s the smallest adjustment and frankly gets swamped by the others. Now I know what you’re thinking. You’re thinking that I’m just cherry-picking the data. Skeptics do that, you know — they can’t help it, they’re deluded. After all, these stations could just coincidentally all be in need of massive reduction of past temperatures. That could happen, couldn’t it? One can easily think up a hundred reasons why people simultaneously, across the country in the late 19th century, would all read their thermometers up to 2 degrees too hot, right? Every day. Year in, year out. Uh huh. A glance at Auckland. Does any of this make sense? Auckland temperature series with GHCN adjustments. Click for larger version. 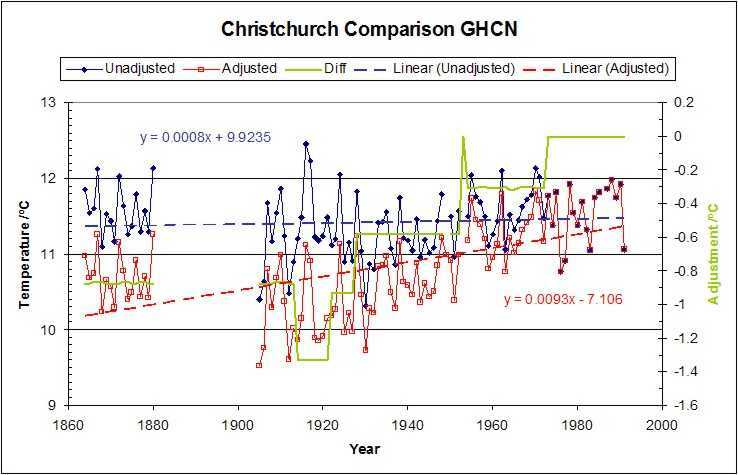 Christchurch temperature series with GHCN adjustments. Click for larger version. 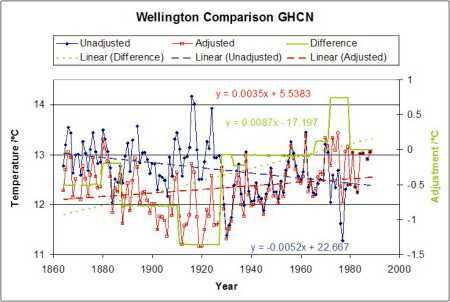 Wellington temperature series with GHCN adjustments. Click for larger version. Let’s look closely at the Hokitika station. It’s had a quiet semi-rural history, running from 1868 to the present, with a break from 1881 to 1893. The unadjusted data (blue series) varies between 11ºC and 12.5ºC most of the time, and hasn’t changed significantly in 130 years. Hokitika aerodrome temperature series with GHCN adjustments. Click for larger version. The red series is the adjusted one. It’s difficult to see how this adjustment can be valid. Have a look at how the adjustments were applied, and when. 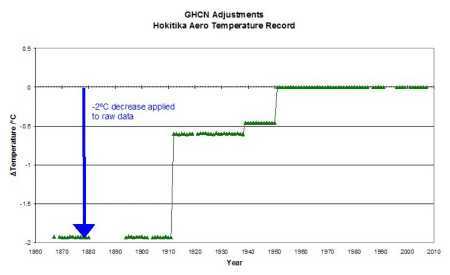 GHCN adjustments to the Hokitika aerodrome temperature series. Click for larger version. The NIWA station record shows nothing untoward, apart from a new screen in 1912. Yet the whole record prior to 1912 is decreased by a huge -2ºC. After 1912 the decrease is a mere -0.6ºC until 1938, when suddenly we decrease by only -0.46ºC from then on. According to the record, nothing unusual happened in 1938 or 1939. The only entry near here is 1937: “Routine inspection. No problems.” The next entry is in 1943 and involves moving a Dines rain gauge. So these adjustments don’t appear, on the surface anyway, to be necessary due to station moves or anything like that. And then from 1951 the whole charade is over and the data from then is unadjusted until the present. What happened in 1951, you ask? Well, nothing. The nearest entry is 1953: “Routine inspection. No problems.” Notice how the actual temperatures after 1951 show no warming — just a gentle flat trend until the present. Now it seems to me that something isn’t right here. It seems unlikely that the pre-1912 data had to be corrected because it showed unrealistic temperatures relative to nearby stations, simply because there were no nearby stations back then. Neither the data nor the history shows any reason for the adjustment. If the pre-1912 data is so very suspect that it’s a full 2ºC out, why bother to include it at all? Based on the laws of chance one would expect the station adjustments to even out. How likely is it that four of our five long-term stations all end up having their early data adjusted downwards, and the only one that doesn’t is coincidentally the smallest adjustment? Even if some of the corrections can be justified technically, shouldn’t the public be made aware that almost all of the warming in New Zealand comes from the adjustments? And shouldn’t they front up with the reasons for the corrections, when so much is at stake? Why does this matter? Who cares if some little corrections skew the data a bit? Well, normally, almost nobody would care, but you see that NIWA graph we started with uses adjusted data. They don’t publish a graph of the unadjusted data. If they did, it would show a very slight warming trend of about 0.06º per century. That’s right – essentially no warming. Of course, if you measure since 2001, we’ve been declining at -1.9ºC per century! And if the current trend continues, we’ll be heading for an Ice Age! New Zealand aerodrome temperature series with GHCN adjustments. Click for larger version. And would that graph be useful to a government hell-bent on pushing us into economically disastrous new laws to govern carbon emissions? No, I think not. Here are the Hokitika Aero station notes as at November 2009, when we began our investigation into the national temperature record. Our conclusions then still seem justified, but please note that more information has since come to light that gives a better, though partial, explanation for the adjustments here. However, NIWA have still not provided justifications for any adjustments except in the case of Hokitika, where they have totally repudiated their previous explanations (such as highly technical changes on the basis of altitude differences) and simply “compared” the moved station with “neighbours”. Nobody has described how to perform such a comparison or explained why you would do that rather than simply run the old and new stations concurrently for a while. 01-Jan-1866 Station opened at rear of government buildings. Good exposure. 02-Jan-1866 Max-Min recorded in tenth degF 1866-1880. 30-Dec-1880 Forms record max on day-of-reading up to Dec1880. (Max has been shifted back 1-day in MAX_MIN_TEMP table). 02-Jan-1894 Max-Min recorded in half-degF 1894-1899. 03-Jan-1894 Forms record max on day-of-reading up to Dec-1899. (Max has been shifted back 1-day in MAX_MIN_TEMP table). 10-Sep-1912 A new screen was installed. The enclosure was too small. The raingauge was moved to improve exposure. 19-Jan-1928 Routine inspection. The raingauge was loose in a box and probably underestimated rain. Screen needed painting. Sunshine recorder on roof and inconvenient for observer to change cards. Enclosure still too small at 2.1 m by 2.7 m.
25-May-1929 Routine inspection. No problems. The enclosure had been enlarged on 24 October 1928 to 15 m by 12 m.
10-Jan-1931 Routine inspection. Rusty tacks needed replacing to secure louvres in screen. 03-Dec-1934 Routine inspection. The raingauge was moved to improve exposure and reset to correct height. Grass minimum thermometer giving problems and replaced. Other instruments in good order. 14-Feb-1937 Routine inspection. No problems. 24-Jun-1937 Routine inspection. No problems. 01-Aug-1942 Dines gauge transferred to airport. 25-Jul-1943 Routine inspection. Screen in poor shape and repaired. Raingauge had small inner can which often overflows. To be replaced. Instruments to be moved to new site effective August 1943. 22-May-1944 Routine inspection. No problem. First inspection of Hokitika Southside. 05-Jul-1944 Routine inspection. No problems. 03-Mar-1953 Routine inspection. No problems. 09-Aug-1957 Routine inspection. No problems. Very good station. 31-Dec-1964 Station replaced by F20793 which opened in November 1963. Unbelievable! So most of the warming is man-made just as the IPCC said. But they implied that we’d all been at it, not just 2-3 NIWA boffins slogging away with calculators in a smoke-filled Wellington room. I read that the National Library has solid records of about 50-years of temperature readings at six of those seven stations up to 1920. During that period, the stations hadn’t moved and there was no UHI or any other reason to apply adjustments.But, in every case, the mean temperature line was basically flat. AND (and this is the big one) the flat lines for those 6 stations were at the the same level in 1920 as they are in NIWA’s records for 1970-2000. Now you can’t have 6 flat lines in 1920 at the same level as in 2000 but still say temps went up by a degree at each of those stations! This makes me wonder what is the point of the big new project to create a reliable SSS and see whether it has a warming trend? We all know now what the result has to be. That’s stunning. What records are you referring to? I agree that the temptation for NIWA scientists to ensure a strongly warming trend must be great. But the Coalition has competent scientists fully capable of providing a comprehensive review of the eventual temperature series. I am sure that NIWA will want not only to cooperate with our review but also to be seen to cooperate, so any data or methodology the Coalition asks for will promptly be handed over. If there’s a problem with it, we’ll find it. There’ll be no “hiding the decline” in New Zealand. The first is exactly when were the downwards adjustments made for the various stations, ie, I would expect documentation for the adjustments to explain why, and that they would have both the date of the explanation and the date the adjustments applied.. do you know these dates? Second, if adjustments were made for the UHI effect (and I accept Hessel’s comments of the 70s that most/many of the main stations have this effect), what rationale was used? I understand that other less effected/rural stations might have been used but haven’t seen anything published on this. Third, if other less affected/rural stations were used to correct for UHI.. then the adjusted stations are much less important than the control stations.. is that a fair comment? Fourth, from my reading I understand that a thermometer in an unpopulated area of say, only 20-30 people per square km reads the actual temp but that as several hundred people per sq/km move in there is a rapid rise in temp from their increased modification of the environment eg, land use change. If this is correct then the dates of any adjustments made to the main stations using rural stations as controls become critical.. is that a fair statement? Call him Rupert Bear, if you like. But he is discredited if he uses a non-de-plume. No scientist worth their salt would present something like this anonymously. It discredits it right off. It shows s/he refuses to stand by their “work”. And, of course, it announces to any potential reader – don’t take this seriously. If the author has any confidence in this analysis – why remain anonymous???? And your real name, Sir? Nice to see Ken Perrott is back, with his usual constructive approach. JC: The downwards adjustments were finally disclosed in a February 2010 “Schedule of Adjustments” available in a pdf down-loadable from http://www.niwa.co.nz/our-science/climate/news/all/nz-temp-record/seven-station-series-temperature-data. It will be seen that they mostly occurred during 1910-45 – and were unsurprisingly followed by the strongest warming period in the NZ instrumental record. No adjustments were made to offset UHI, as this would have dampened any warming trend. Hessell has been ignored. Adjustments are made only in cases where one station has been replaced by another in a different location. To add further confusion, all the adjusted stations used all the other adjusted stations as ‘control’ stations. So each downward adjustment to one station rippled through all the others in turn. Ahh, Ken – nice try, but let’s stick to the facts shall we? A rose by any other name, and all that…. P.s. – in answer to your question, so that he/she doesn’t have to worry about rocks through the window in the middle of the night by fanatical elements of Greenpeace. Or whatever other privacy he/she may desire to retain for whatever reason. If Tamino can do it, why can’t Rupert? The facts are that Richard is hiding behind a fictional name. This means article is discredited before it starts. I have never before come across “scientists” who refuse to take responsibility for their work. That indicates a complete lack of integrity. Mike pointed out that Tamino is not criticised for using a pseudonym. If it’s all right for her, why not Rupert? Might I suggest Richard, in the present climate the extremism is coming from deniers – at least overseas. Death threats, etc. Calls for hanging in the public square (aimed at Mann). Even in NZ our Chief Scientific Advisor to the PM has got extreme threats. Yet I don’t see any climate scientist hiding behind false names. (If your anonymous “science team” is so frightened of bricks how come they allow you to be used as the fall guy. You make a foll of yourself with your lack of scientific knowledge but I am sure on-one is throwing bricks through your window). No – its a clear indication that Rupert (if s/he exists) does not have the confidence in his/her words to put his/her name to it. Tell me any other scientists who has or is doing such things? In the scientific community this would indicate a complete lack of integrity. No one would bother reader such rubbish. The extremist nonsense you mention is deplorable, to be sure. Yet some scientists do use nom-de-plumes, like Tamino. It doesn’t matter, I treat what they say as commentary and examine what they say for any truth it might contain. If they wanted to publish in a journal, then of course they would be identified and we wouldn’t know their other identity, would we? Some of the Coalition scientists are young men, with jobs in commerce and industry that would be unnecessarily disturbed by association with the volatile and emotive realm of the climate change scam. I respect their desire to take a back seat. It doesn’t worry me, I’m keen to spread the true facts and I have no reputation to damage by being in the front row. It would be very nice if you could find something else to write about now. Such as the question I asked you about NIWA and their shenanigans. I mean, have you looked in Salinger’s thesis for the “methods” and the “SOA” NIWA claimed were there? But anyway, good to see you back here. No Richard – they are ashamed of what they have written. Otherwise it would go proudly on their CV. First time I have seen scientists disowning their work like this. Broken windows, jobs, etc. Pull the other one. At least Doug Edmeades case is obvious – he uses it to appeal to his clients. Sorry, Richard – I should not have broken my rule – should I? It’s just this “anonymous scientists” is so hypocritical. But, no, after you deleted my comment about your associations with Rodney Hide, The ACT Party and the NZ Centre for Polirtical research (Extreme right wing “think Tank” with international links exposed by Nicky Hager) I did say I had a rule of no further commenting on blogs censoring comments. In the comment I deleted, you said nothing of the kind. And so – about NIWA? What are the extreme threats received by Peter Gluckman – or did Ken make that up? Well, looking back at NZ from Aussie and what do I see… people yelliing insults at each other and calling each other names instead of debating the science…. The pool is too small. Does anyone have a reasonable explanation as to why NIWA faked these results?